Gentle microdermabrasion-like exfoliation:The Tagua Palm seeds produce this unique exfoliator. Called Vegetable Ivory, this exquisite powder provides deep yet gentle exfoliation. 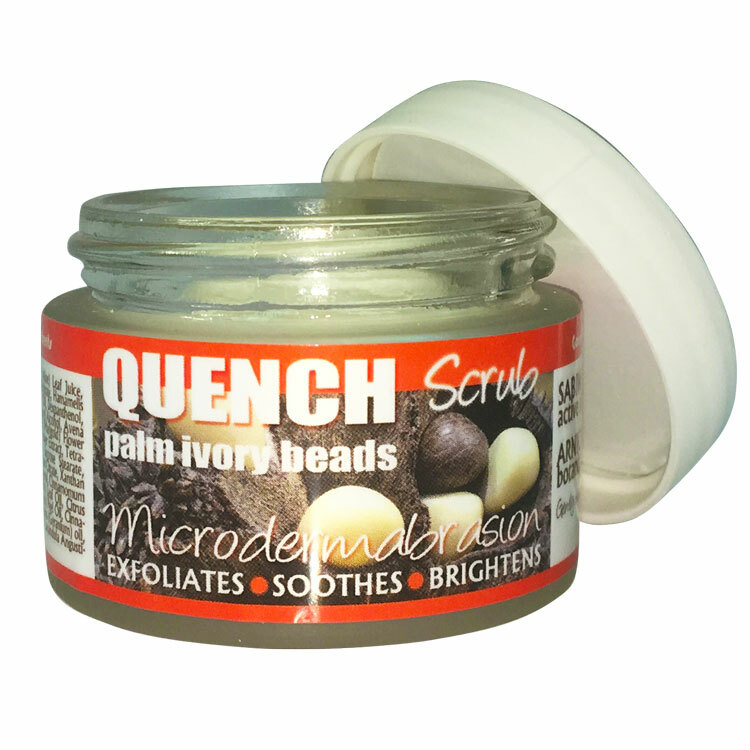 QUENCH SCRUB MICRODERMABRASION contains Tagua (Vegetable Ivory) Palm beads to gentle exfoliate your skin. 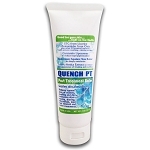 This renewable resource, sustainable harvested exfoliant is formulated in a skin friendly and eco-friendly personal care product In addition, QUENCH SCRUB MICRODERMABRASION contains 12 of the best studied botanicals with skin soothing and brightening action to reveal a more beautiful, glowing complexion. Phytelephas Aequatorialis (Tagua Palm) Seed powder#, Aloe Barbadensis (Aloe) Leaf Gel*, Butirospermum Parkii (Shea) Butter*, Cetyl Palmitate, Avena Sativa (Oat) Extract*, Borago Officinalis (Borage) Oil*, Hamamelis Virginiana (Witch Hazel) Extract*, Triethylcitrate, Dexpanthenol, Glycine Soja (Soybean) Sterols, Cetyl Alcohol, Stearyl Alcohol, Squalane, Calendula Officinalis Flower Extract*, Stearyl Glycyrrhetinate, Bisabolol#, Arnica Montana Flower Extract, Algae Extract#, Tetrahydrodiferuloylmethane, Sodium Hyaluronate, Allantoin, Glycerin, Sucrose Stearate, Sucrose Distearate, Benzyl Alcohol, Tocopheryl Acetate, Sodium Citrate, Xanthan Gum, Hydrogenated Lecithin, Cinamomum Camphora (Ho Wood) Leaf Oil, Mentha Viridis (Spearmint) Leaf Oil, Dehydroacetic Acid, Citrus Grandis (Grapefruit) Peel Oil, Citrus Medica Limonum (Lemon) Peel Oil, Cinnamomum Camphora (Camphor) Bark Oil, Pelargoniun Graveolens (Geranium) Oil, Salvia Sclarea (Clary) Oil, Thuja Occidentalis (Cedarleaf) Oil, Lavandula Angustifolia (Lavender) Oil.